There are 34 symptoms that can affect women going through menopause. Most women experience a combination of symptoms. 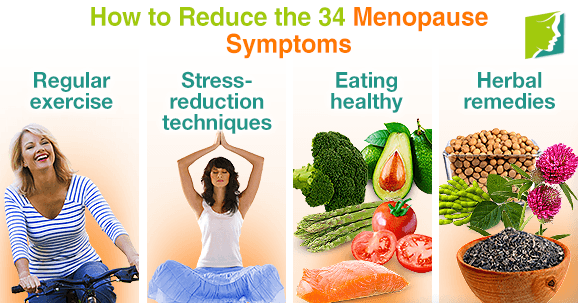 Learning how to reduce the 34 menopause symptoms can help improve your quality of life. The most widely reported menopause symptoms are hot flashes, night sweats, irregular periods, loss of libido, and vaginal dryness. Women typically experience menopausal symptoms until the end of the menopausal transition, but they may last into postmenopause. Keeping fit is a vital part of life and can be helpful in reducing menopause symptoms. Frequent physical activity improves sleep patterns and mood. Exercise may also relieve night sweats, by reducing stress and balancing out hormones. Yoga, tai chi, and meditation are all ways to reduce menopause symptoms by using conscious breathing and stretching techniques. Acupuncture is another method that may be beneficial for women looking to reduce stress. Vitamin C. Commonly found in oranges, broccoli, cabbage, asparagus, and tomatoes. Vitamin E. Found in asparagus, almonds, lamb, brown rice, and mangoes. Vitamin B. Wheat germ, oysters, and liver are all high in vitamin B.
Fatty acids. Omega 3 and Omega 6 are fatty acids found in flax seeds, walnuts, salmon, and tofu. Phytoestrogenic herbs. These herbs help supplement the body's depleting estrogen levels and return functioning to normal. However, in some cases, they can result in a dependency and symptoms may worsen when you stop taking them. Non-estrogenic herbs. These herbs don't contain any estrogen and work in harmony with the body, stimulating its own production of hormones. In general, they are considered safer than phytoestrogenic herbs. Click the following link for more information on menopause symptoms treatments. Is HRT the Best Treatment for Menopause Symptoms? When women experience the symptoms of menopause caused by fluctuating hormones, they want the most effective treatment.